A canopy of grape vines rustles in the early evening breezeover the tables of a small cafe which sits tucked on a landing halfway down a winding, ancient stone staircase. The spire of the magnificent Lutheran cathedral towers above it. Just then, a group of teenagers, obviously dressed for a night out, scramble past us up the stairs, laughing and jabbering away excitedly. Sitting at a table in the restaurant, Mariana Filip looks at the scene and smiles. "This is a place where the future and the past work together," she says. "They (the young people) are the future. But when I sit here in the evening and look around me, at the walls, at the tower and the stairs, I feel like I'm sitting in the 1400s." 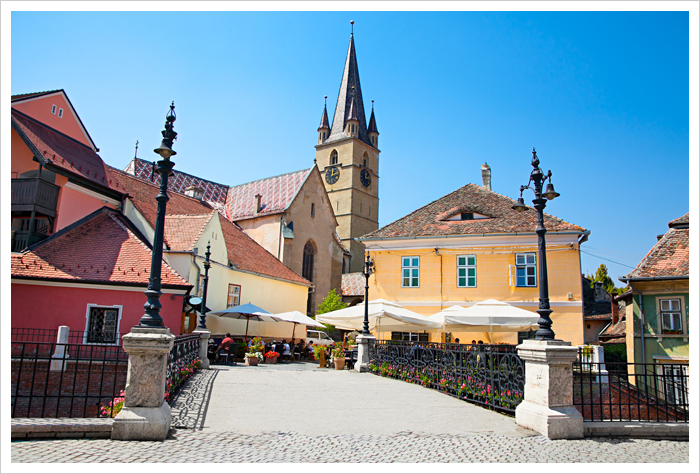 Sure, you could say that in just about any European city, but Sibiu has a character unlike many other such places. Its old town is set apart from the modern, lower city, and the lack of both extensive modern development and mass tourism lend give it an unspoiled feel. And the residents are quite happy to keep things that way. 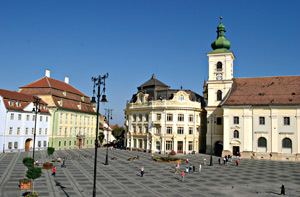 Sibiu has for centuries been a centre of culture, faith and scholarship, and it was in the forefront of the Romanian revolution of the late 1980s, and still proud of its history. "People come to this city for its authenticity, because we maintain our traditions," says Mariana, the manager of the tiny restaurant called Pivnita de Vinuri, where we're enjoying a splendid dinner of grass-fed veal cooked in a sour cream sauce that renders the meat as soft as butter. The meal has a German flavour, as does the restaurant, reflected in its other name, Weinkeller. That, too, is typical of Sibiu, and indeed, all of Transylvania. 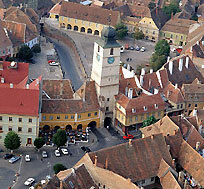 The city itself has three names - Sibiu, Hermannstadt and Nagyszeben - reflecting its unsettled, often turbulent, past. Germans from Saxony first came to the region in the 14th century, and in subsequent ages, control shifted from Hungarians to Ottomans to Romanian, to Austrians and, finally, after World War I, Romanians again. During the post-World War II era of Communist rule, much of the ethnic German population emigrated, but they left their stamp on the city's culture and architecture. The Old Town has an almost "Viennese" ambience, with its baroque buildings painted in the so-called Hapsburg yellow. The Large Square (Piata Mare) is wide-open and breezy, its patchwork pavement often crowded for concerts on summer nights, and always full of youthful energy in its surrounding cafes and restaurants. Its dominant feature is the magnificent Bruckenthal Palace, once home to the Austrian governor of Transylvania, and now a splendid museum housing more than 1,200 paintings and 300,000 books. Flanking the square are 17th century residences, several stories tall, and with a curious aspect. "I always feel like I'm being watched when I walk here," says my guide, Ana Maria Dora, as she points at tiny, slit-like windows atop the buildings. "They call those the 'eyes of the city,' they follow you wherever you go." In the midst of the square stands an ornamental flower garden in a brick structure surmounted by wrought-iron fencing. It almost seems out of place in its isolation, but its modern appearance is an adaption of its ancient function. "That looks like a cage," says Ana, "and it is a cage, or at least, it was a cage. In the old times, merchants who cheated, or were caught stealing, or people who were drunk in public were put in there and people passing by would throw rotten vegetables and eggs at them as punishment. "Now, it's a flower garden, but some people say, 'That was a good idea, maybe we should put it back the way it was'." We wander along a small passageway that leads into the Piata Mica (Small Square, naturally). Here, the surrounding buildings are fronted by arches, another remnant from the past when masters of the town's many guilds sold their wares under their protective cover. On this evening, they shield a choir of Romanian schoolchildren who, enchantingly dressed in traditional Transylvanian costume, serenade the passersby with old hymns and folk songs. 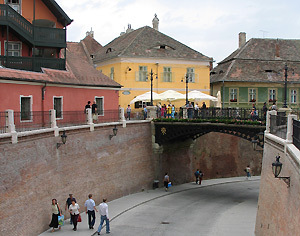 After their performance, the kids happily run for their reward (ice cream at a nearby shop), crossing a small bridge that extends over a road leading to the more modern lower town below. This bridge, apart from being the first cast-iron bridge in Romania (1859), also has a colourful past. It's called the Liars' Bridge, says Ana, and there are a number of theories as to how it got that name. "Well, the bridge was built by someone named Lugner, which in German means 'liar'," she says. "Also, the houses in the square used to be owned by the merchants and, as we know even today that sometimes successful business people aren't always the most truthful. "And lastly, this is a favourite spot for lovers to walk in the evening, and they stop on the bridge and say things to each other, and, well ... you know, lovers sometimes lie."